Cost: Not fast food cheap, but not super expensive. Check out the MENU. Our Review: Paulie’s is the perfect little neighborhood restaurant. It has a classic storefront on Westheimer with plenty of parking in the rear and side streets. Paulie’s is a casual Italian restaurant that is welcoming to families and adults alike. 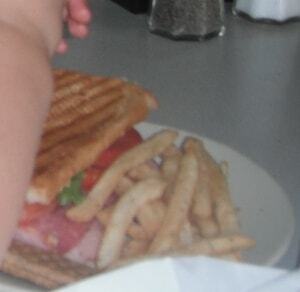 There is no kid’s menu, but with sandwiches and pasta, it’s easy to find something that kids will like. We ordered a Pizzitola Panini (fresh mozzarella, Roma tomatoes, pesto) for $7.95 and an Italian Hoagie for $7.95. My 4 year old, 2 year old and I shared the food and had a whole box of leftovers. I also noticed that you can get a lunch special with half a panini and soup or salad for $7.75. Also, from 12:00 – 4:00, daily, alcohol is half price. The food was fantastic and we had large portions. The atmosphere is very casual, clean, comfortable and just a little fancy. 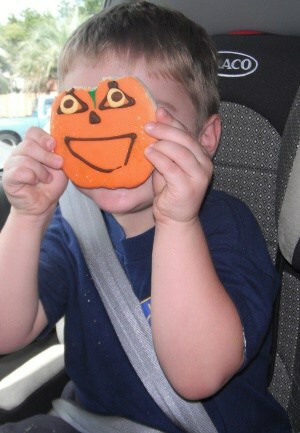 At the end, my kids convinced me to get the fancy Halloween cookies as a special treat. They are pricey, at $3.00 each, but they are very cute and would make a special little surprise for someone.